Each issue of our company newsletter covers a topic of interest to the mass spec community, such as SIS products/services/promotions, articles relating to MS/GC/LC and related lab equipment, and company news. You may subscribe here or unsubscribe via the "unsubscribe" link in your e-mail. Introducing many new products, including Yttria filaments, plus SIMION 8.1.1 demos/training Mon-Wed.
SIS can now repair your filaments with Yttria coated rhenium alloy wires and coils to replace the standard rhenium uncoated filaments. SIS repairs your filaments with our non-sagging rhenium alloy filament (SISAlloy®) material. We then electrically coat the filament with a thin film of yttria oxide. The result is a filament that does not sag due to the rhenium alloy filament material and the yttria oxide coated filament operates at a lower filament temperature to produce long life filaments. Yttria coated filaments have been used in the vacuum tube industry for more than 50 years. Yttria has a lower work function than rhenium or tungsten. Therefore they emit electrons at lower filament current and therefore lower filament operating temperature as shown in the chart below. This results in increased filament life. In addition the thin oxide coating on the filament surface protects the filament wire from oxidation or chemical attack. This is why the Yttria coated filaments are used extensively for leak detector filaments. 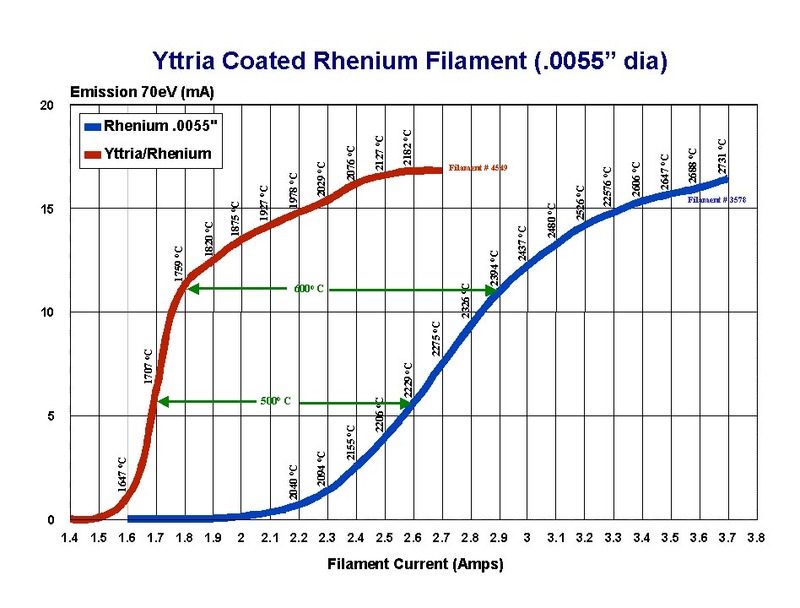 SIS can repair most styles of filaments using the combination of rhenium alloy material and yttria oxide coatings, including the Agilent 4 coil filaments which are described in the study below in which we cycled the filaments ON and OFF in our testing system in order to determine its life. Agilent 4 Coil Filament Study: The Agilent 5973/5975 filaments studied have demonstrated to typically last 2 to 3 times longer than standard plain rhenium filaments. In addition by using SISAlloy instead of pure rhenium, filament warping is reduced, thereby improving filament performance and lifetime. The pictures below demonstrate 3 times normal life from one of our studies in which the filament was cycled on and off. A pure rhenium filament lasts about 4,500 cycles in our studies before it burns out, but at 16,000 cycles the yttria coated filament was still operating. Caution: Do not touch the filament surface. The yttria coating is a weak electrostatic coating onto the surface of the wire. The yttria coating is easily removed by touching or rough handling. Ordering Information. Please specify that you want your filament repaired with the yttria coated SISAlloy material by using the part number FILREPYA when sending your filaments in for repair. For additional details on our SISAlloy/Yttria-coated filaments, see our web pages.